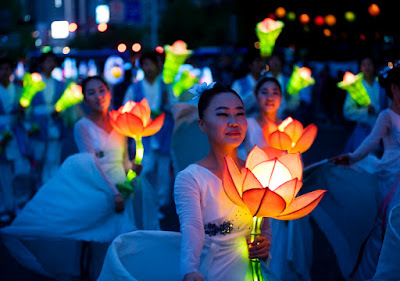 During July and through the early weeks of August (at the edge of the monsoon season) it’s the time to enjoy the blooming of the Lotus flower. Either pink or white, it can bloom in even the foulest water; retaining its beauty without letting its environment taint its pure nature. 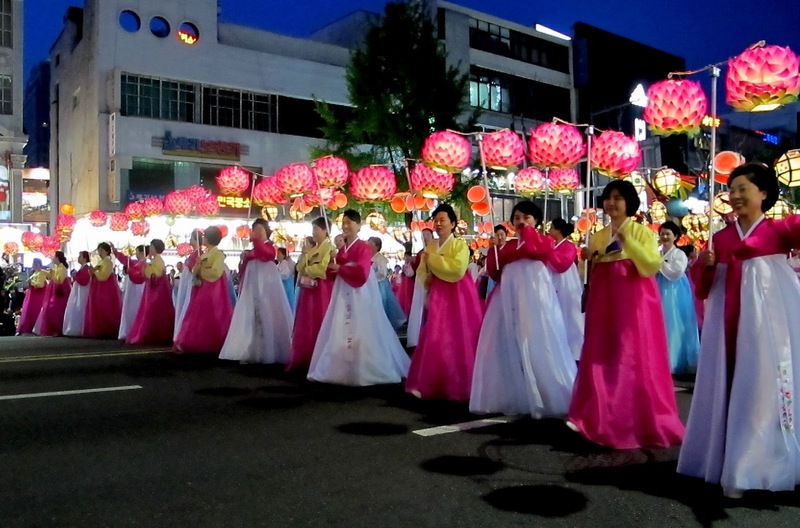 The lotus is a very important symbol in Korean culture. Not only the blossoms, but also the roots, the leafy pads – the whole flower. 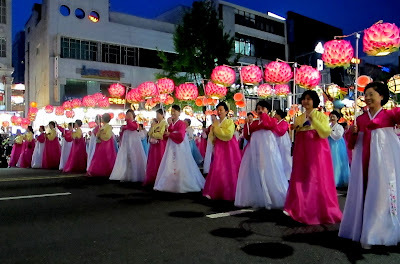 It shows up in literature, in art, in architecture, in pop culture, and in food and of course in Buddhism. The lotus flower grows in muddy water and rises above the surface to bloom with remarkable beauty. In Buddhism this is a symbol of the true nature of beings, which remains unstained by the mud of the world and is realized through enlightenment. The flower closes and sinks underwater at night, to rise and open again at dawn. 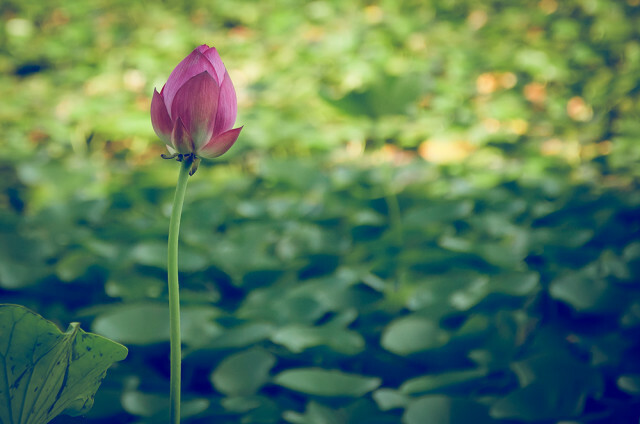 Untouched by impurity, the lotus symbolizes the purity of heart and mind. Many in Seoul, South Korea, celebrate the birth of Buddha at the Lotus Lantern Festival. 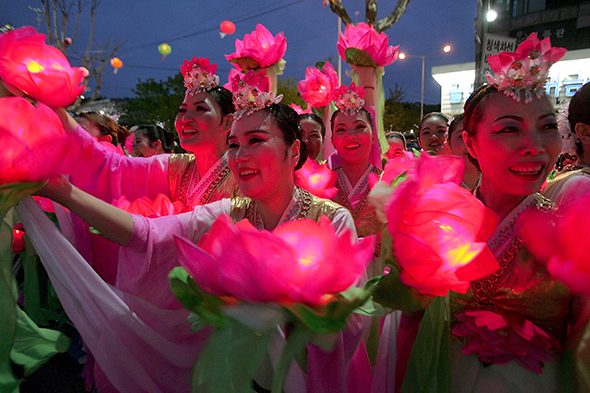 At the festival, you'll see lots of painted faces, parades, fireworks ... And lots of beautiful lotus flowers! 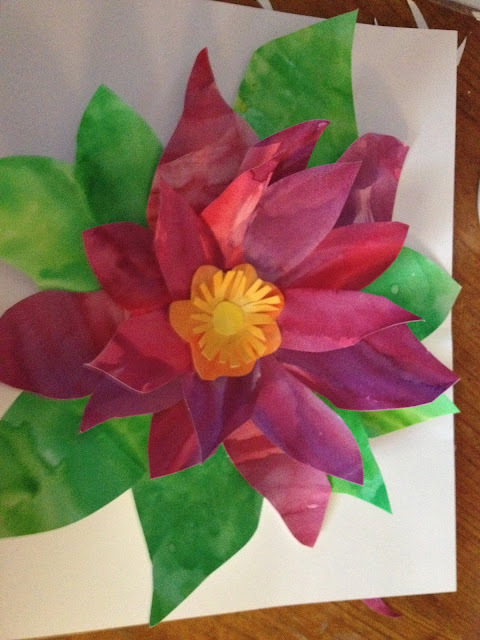 Today we are going to construct our own lotus flowers - and they're going to be 3D, not just flat on the page! Step 1 - The Petals. Using the first piece of paper, paint the flower petals in reds, pinks and purples. 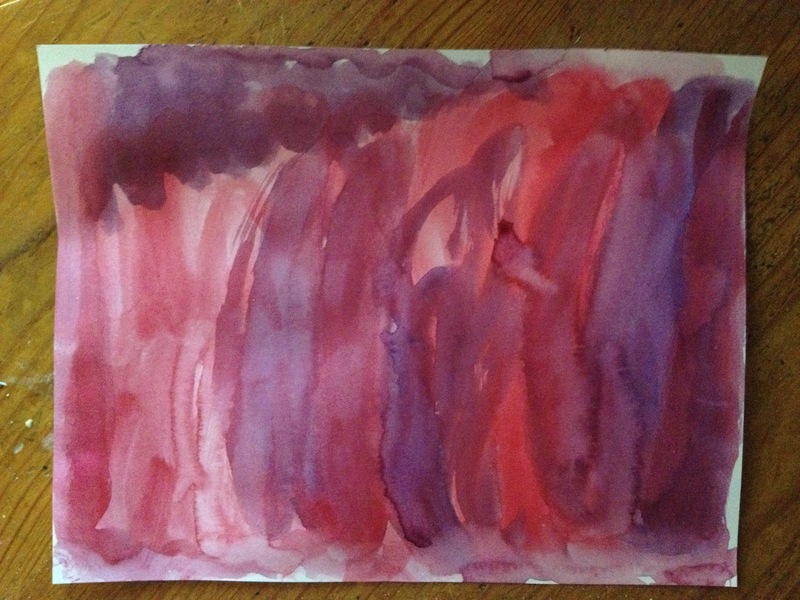 (Docents: Add a few drops to each artist's paper and have them paint). Set aside to dry and clean brushes. Step 2 - The Leaves and the Center of the Flower. 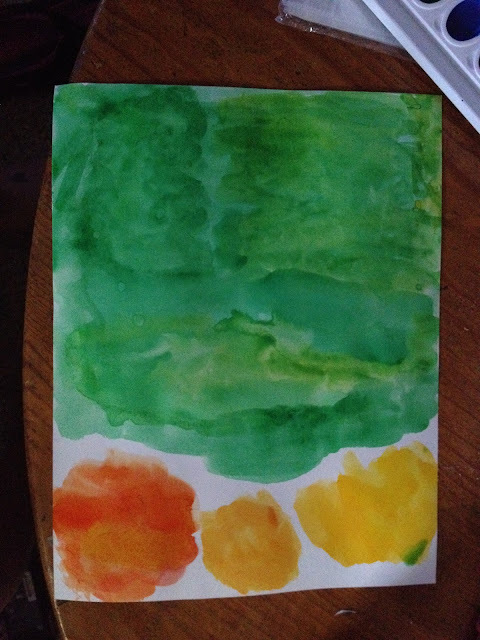 Paint 2/3 of the page with different shades of green for the leaves, and the other 1/3 with oranges and yellows that will be used for the center of the flower. 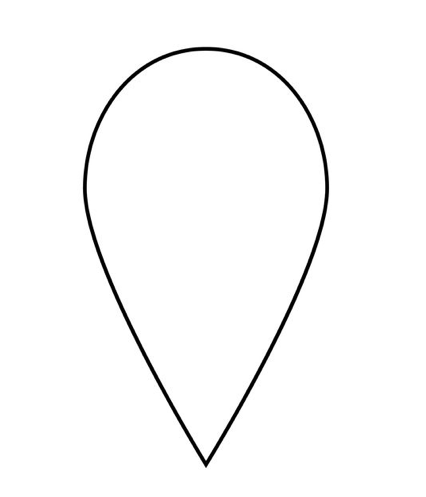 (Docents: Start with the greens and instruct the artists to paint in the area indicated in the picture. Then add orange and yellows). Set aside to dry and clean brushes. Step 3 - Background. This is where our lotus flowers will be mounted. 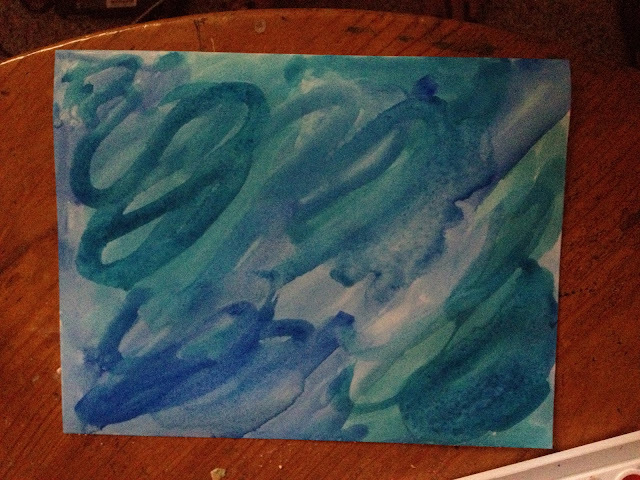 Paint with a blend of blue watercolors. Set aside to dry and clean your brush and empty your water containers. 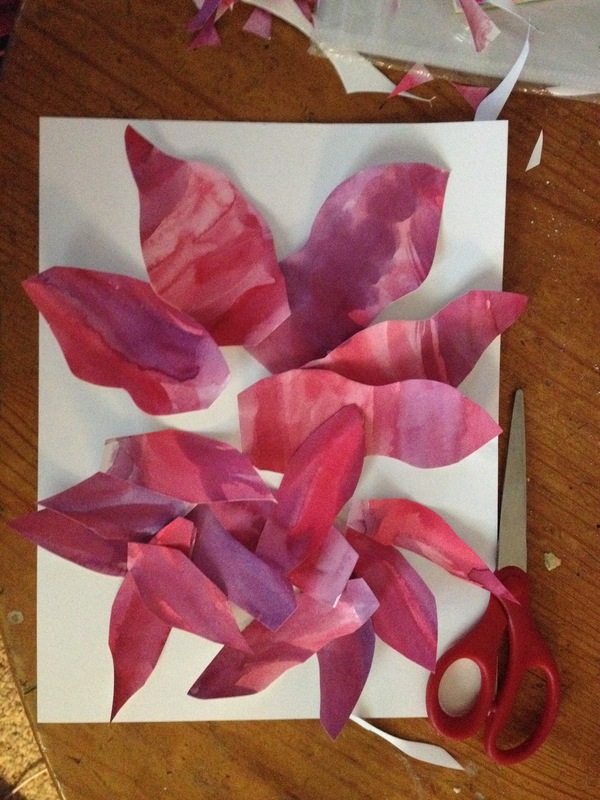 Step 4 - Cutting out the Petals. 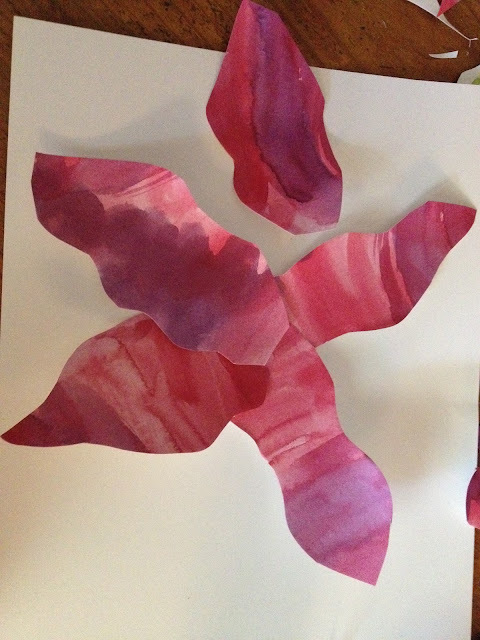 Go back to your pink paper and cut out 4-5 large petal shapes, then 5-6 smaller petals, then even a few smaller petals until all of the paper is used. A good guide is to have the artists cut their paper into 1/2, 1/4 and 1/4 strips. The first half should be used for the large petals, the second 1/4 should be used for 5-6 smaller petals and then the last 1/4 can be used for smaller petals (and extra large ones if needed). 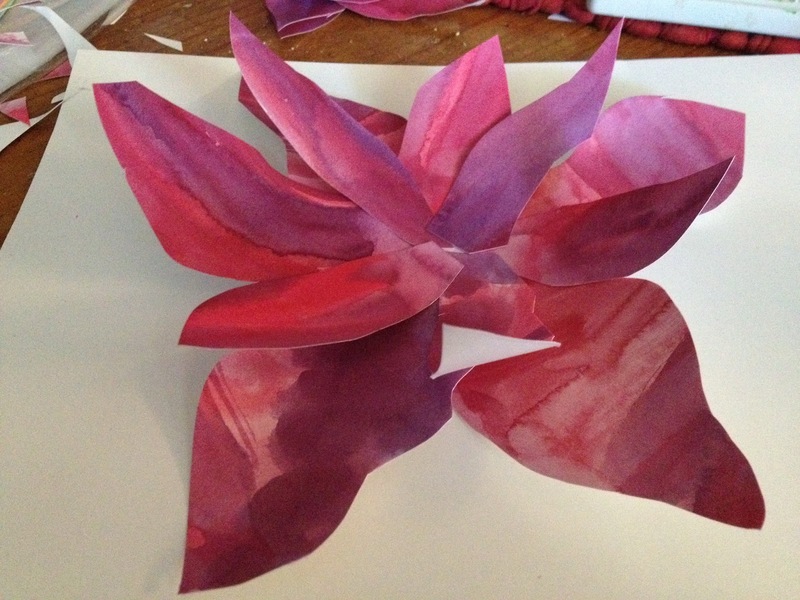 Demonstrate how to cut a petal - with curvy lines. Step 5 - The Leaves. 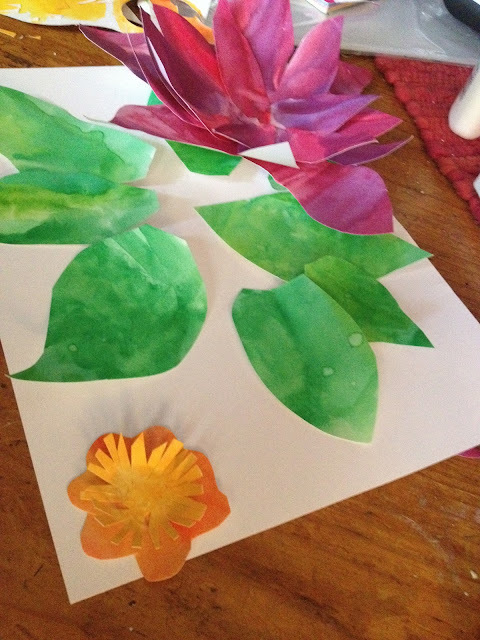 Using all of the green area of your paper, cut out lots of leaves in various sizes - use all of the paper! 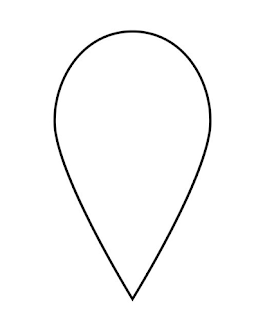 These are going to be a similar shape to your petals (see above). Place your yellow/orange part of the paper aside - we won't need that yet. Step 6 - Arrange Your Flower! Arrange the largest 4-5 flower petals evenly so that their centers overlap in the middle. Put a small amount of glue on the end of the petals - only where they overlap in the middle. 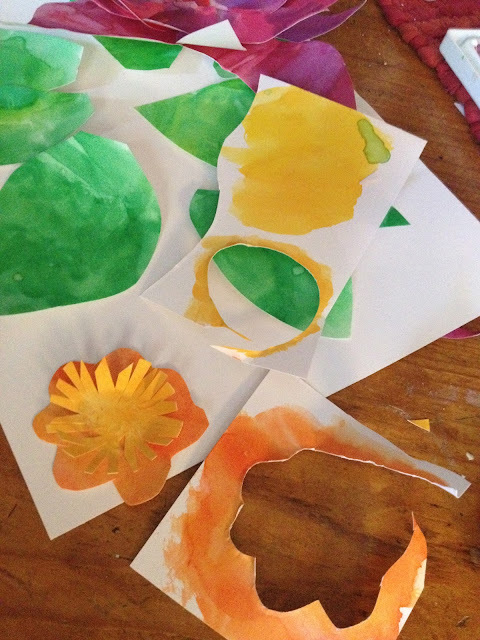 Do not glue them down on the paper you're using as your mat ... Just a little bit of glue in the centers! We want the petals to pop up which will give them the 3D look! 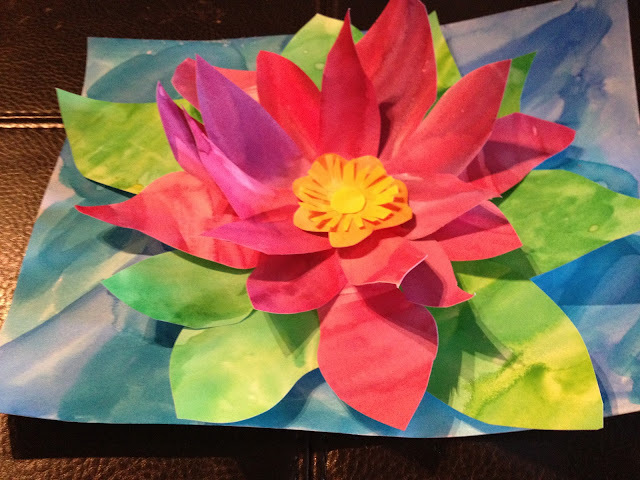 Continue layering the smaller petals in the center - again with just a little glue. 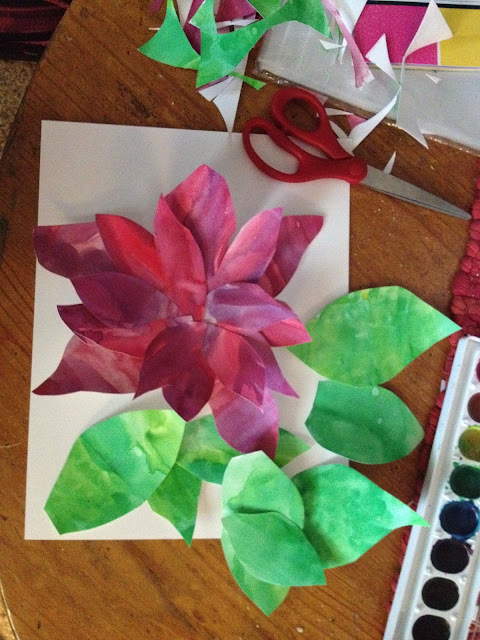 Continue until all of the petals are arranged and glued into place. Allow to dry. Step 7 - Adding The Leaves. Use the leaf pieces and arrange them evenly - peaking out from UNDER the edges of the flower. When you like how they are arranged, put a small amount of glue on the leaves and attach them to the flower ONE AT A TIME. Continue until all the leaves are used. Step 8 - Create Center of Flower. Cut out the center of the flower in a scalloped pattern. Then cut out the yellow and cut little "fringes" - kind of like a sunshine. Glue the "sunshine" on top of the orange scalloped piece. Finish with a small round yellow circle in the center. 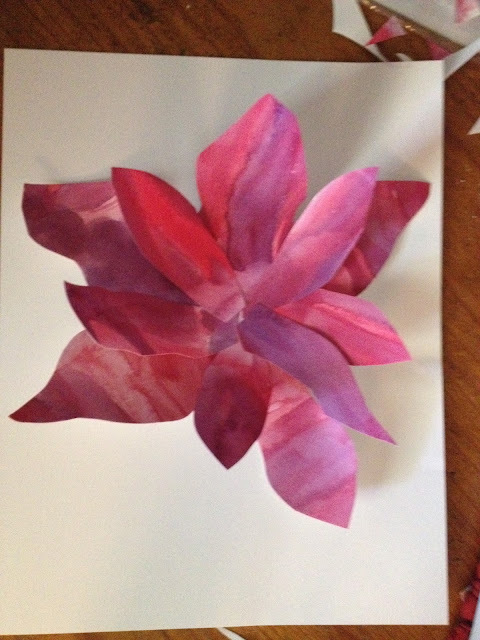 Add to the center of the pink flower (this will cover up where you have glued the pink petals together). Step 9. Add the Flower to Your Blue Background. 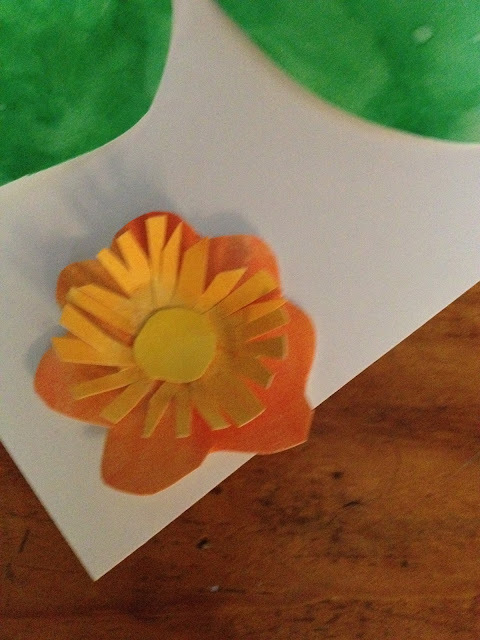 Glue the completed flower onto the background piece of paper. Beautiful!